Did you wonder how a nefarious bill that suddenly, subtly, and seamlessly made mincemeat of the Constitution and Bill of Rights sailed through both houses of Congress with overwhelming bi-partisan support and nary a debate? Well, here’s how. It was greased by — guess what? — the usual: money. Hacktivists are continuing their mission to take on politicians causing the collapse of constitutional rights in America, with operatives from the online collective Anonymous keeping up a campaign against the signers of controversial legislation. Members of Anonymous began a campaign last week to expose information on the lawmakers who voted in favor of theNational Defense Authorization Act for Fiscal Year 2012, a bill that will allow for the indefinite detention of American citizens, the reinstating of torture methods and the creation of the United States as a battlefield. Despite the implications of the act, the Senate allowed for the bill to leave Capitol Hill on Thursday, leaving only the inking of President Barack Obama’s name as the final step for ratification. President Obama had earlier insisted on vetoing the bill, but the White House retracted that statement in the days before it cleared Congress. Before the final draft left the Senate yesterday, Sen. Carl Levin asked that a statement from the administration be added to the record in which the president’s press secretary, Jay Carney, said that the president will not be advised to strike down the bill. On Thursday, Anonymous hacktivists launched a campaign against Senator Robert Portman, a Republican from Ohio. Not only did Portland vote in favor of NDAA FY2012, he received $272,853 from special interest groups that also backed the bill. “Robert J. Portman, we plan to make an example of you,” writes an Anonymous operative. The hacktivist has also released personal data including the senator’s home address, phone number and social networking accounts in an attempt to further an infiltration from the Internet to show the opposition to the bill that colossally impacts the constitutional rights of Americans. According to the information posted by the operative, the nearly $300,000 in special interest monies lobbied at Portman could have helped him purchase around $1.7 million in real estate in Ohio. The next lawmaker to receive anywhere near as much as Sen. Portman is Senate Majority Leader Harry Reid, a Democrat from Nevada and third-ranked official in Congress, who pulled in more than $100,000 less than his Ohio counterpart with $172,635. Anonymous says that this is just the beginning of the campaign against those that are creating the collapse of the US Constitution. With NDAA FY2012 almost guaranteed to be approved by Obama any moment, a second piece of legislation, the Stop Online Piracy Act (SOPA), is close to clearing a Congressional committee. Should that bill be brought before the president and signed into law as well, Internet access and content across America and the world will become largely censored. In the memo from the hacktivists, they include a copy of the Bill of Rights, the first ten amendments to the US Constitution that have been crushed in-part by the latest congressional meetings. 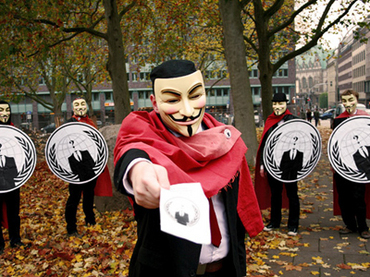 “Every time you violate these amendments we will ensure the people are aware of your actions,” says Anonymous. Anonymous members are using the trending topic #OpAccountable on Twitter to spread the campaign against the congressman involved in the legislation. On Friday, one hacktivist tweeted that the topic is even being used by known members of the Tea Party movement. “Goes to show this year’s outrage is far stretching,” adds the operative. This entry was posted in culture of secrecy, dark doo-doo, Reality Ramp-Up, time acceleration, unity consciousness, Uranus square Pluto, visions of the future, waking up, wild new ideas, zone zero. Bookmark the permalink.